AlmostAGhost’s Top Albums Of 2012: #7. Bear (The Ghost) – What Was All This For? Published by almostaghost on December 29, 2012 in almostaghost and review. 0 Comments Tags: Bear (The Ghost), Cincinnati, Ohio, Top 2012 Countdown. I honestly know almost nothing about Bear (The Ghost). I happened on their album at some point though, and couldn’t get it out of my head. It kept climbing up my list, as I liked it more with every listen. Their warm sound led to numerous plays–no required constant plays–as it fits all sorts of situations: both being played loud and soft, as background music or being trapped with it on a drive, during moments of contemplation or dancing around. And I absolutely encourage everyone to do so. 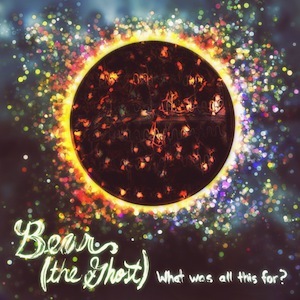 Bear (The Ghost) is my favorite new band that I found in 2012.